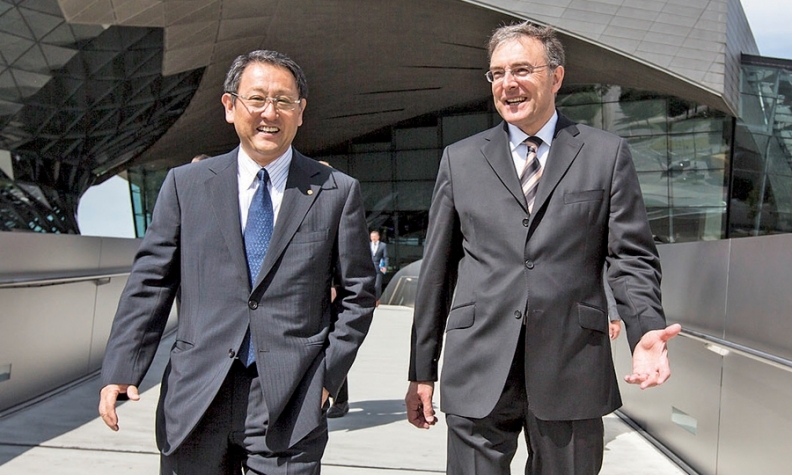 Toyota President Akio Toyoda, left, and BMW CEO Norbert Reithofer: Cooperation extends beyond a sports car. The sports car that BMW and Toyota plan to jointly develop could be a way for Toyota to leap back into a performance segment it has abandoned or possibly provide a high-priced sports model for Toyota's Lexus brand. The two companies agreed last week to work together on an "environmentally friendly" sports car as well as on fuel-cell, electric vehicle components and lightweight materials. "BMW's strength is in developing sports cars," said Toyota President Akio Toyoda, a racing fan who repeatedly has said he wants to add zest to Toyota's lineup. "I am excited to think of the cars that will result from this relationship." Toyoda and BMW CEO Norbert Reithofer signed the agreement in Munich. Details and timing of the cooperation were not discussed. But the sports cars will not be identical or share a common exterior design like the jointly developed Subaru BRZ, Toyota 86 and Scion FR-S coupes, said a BMW spokeswoman in Munich. The Subaru/Toyota coupes went on sale this year. BMW's vehicle "will be a sustainable sports car with environmentally friendly technology," she said. "We are developing the architecture and components for this future car." A BMW insider speculated that the collaboration could provide the basis for the return of the Toyota Supra, possibly using the BMW 6-series architecture. The Supra, once the performance spearhead of the Toyota lineup, was last produced in 2002. "Anything is possible," the senior BMW manager told Autoweek, a sibling publication of Automotive News. "The key factor is that the products of both companies retain their own individual character, despite jointly developed technologies." A Lexus sports car also is a possibility. Lexus showed the LF-LC concept in January at the Detroit auto show. If the concept is built, an executive said the production version would be priced similar to a Porsche 911 Turbo, which goes for more than $137,500. Borrowing BMW's expertise in suspension technology could lend better driving feel and responsiveness to the Lexus brand. Jim Hall, principal of 2953 Analytics Inc. in suburban Detroit, said Toyota could use technology from the BMW i8 plug-in hybrid sports car. "It would be an expensive car," Hall said. "There is an argument that Lexus needs it and that is the logical place for them to do it." BMW is expected to price the i8 at about $125,000 when it goes on sale in the first quarter of 2014. Sharing the i8 technology with Toyota would help BMW spread the cost of the i8's expensive components. In March, BMW agreed to supply Toyota with its diesel engines starting in 2014 in exchange for collaboration on lithium ion battery research. Toyota has been the industry leader in hybrid vehicles, while BMW has expertise in carbon fiber.